During the colder weather, it is important to be more meticulous on maintaining the health of your horse. This includes scheduling regular checkups with a horse doctor, ensuring optimal conditions in the storage barn, and feeding them correctly. Read on for some tips on feeding your horse during the winter! Keeping weight on your horse: it’s a good idea to help your horse gain an extra layer of fat before the cold months arrive to ensure they stay warm. It is actually much easier for them to gain weight before winter begins and keep it on than it is for them to gain weight during the winter weather and keep it. You will want to monitor your horse regularly by running your hands along their ribs, which you should feel only faintly. If you think your horse needs to gain more weight, one trick is to add corn oil to his meals. However, before doing this, it is important you consult your horse’s physician. Always keep a fresh supply of water: fresh and clean water is essential so to ensure you always have a supply, invest in a water heater to make sure it does not freeze. Most horses want water that is 45 to 65 degrees Fahrenheit and if they do not drink enough, they can develop impaction colic. Impaction colic is a painful obstruction in a horse’s bowels and it can be extremely harmful to them if they develop it. To ensure they are getting enough water in the winter, you can mix hot water in their pellet or concentrate feed to make a mash. 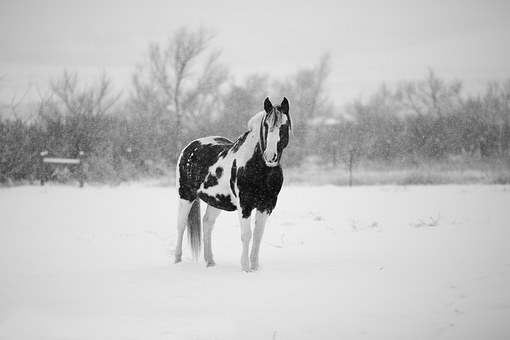 For more tips on properly feeding your horse during the colder months, please refer to our next blog! If you are in need of high quality horse insurance, please trust in the experts at Ark Agency. To learn about our pricing plans, give us a call today at either 320.243.7250 or 800.328.8894!